Did The SAS capture Saddam's Half Brother? 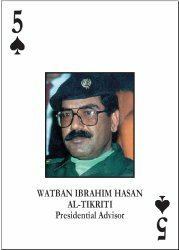 Watban Ibrahim Hasan al-Tikriti was the 5 of Spades in the U.S. deck of cards of wanted Saddam loyalists. Saddam was the Ace of Spades. In April 2003, Saddam Hussein's half-brother, Watban Ibrahim Hasan al-Tikriti, was arrested by, what US officials described as "non-US elements", close to the border with Syria. As Australia also denied that its special forces were involved, it has been assumed that it was UKSF, most likely the Special Air Service (SAS), that were behind the incident. Watban was one of Saddam's three half-brothers and served as Saddam's Interior Minister and Presidential Advisor. He was suspected of various crimes, including overseeing the torture and execution of Saddam's political foes, which numbered into the hundreds. It is believed that the SAS intercepted their quarry in the North of Iraq, near the town of Rabia, on the route between the city of Mosul and the Syrian border. The SAS had been involved in various operations in the north of the country during the opening phases of Operation Iraqi freedom such as carrying out area denial operations, raiding SCUD missile sites and suspected WMD facilities (see here for more details). As Saddam's regime fell, it is believed that the SAS were deployed along the Syrian border region in an attempt to block the escape of pro-Saddam forces. The SAS would soon become part of a multi-national task force with the remit of hunting down top ex-regime leadership figures.